Once Oren has completed so many missions, the wing charm around his neck will transform into a huge pair of wings of his very own. He soars up into the sky, while the feelings of relief and success over so many difficult rescue missions flow over his body with the wind. Well-seasoned and experienced, he has now earned the place of the lead wolf on the team. This is so cool! I love the wing detail and the way the fur flows. I have a question though. Do I have permission to use it as a banner for a wiki page that I have? Here is the link to it. I'll credit you of course. Thank you for asking but please do not repost my art anywhere. amazing :3! i want to use this for my "The dark kingdom VS. The light kingdom"! I do appreciate the compliment but would like if you enjoyed my art in my gallery and did not use it anywhere else. Thanks! I love this draw. I am pilot and I would like to ask you if I can make a sticker of it and put it on my plane. If you have a direct mail i will send you the project. Thank you for asking. I sent you a note here on DeviantART with information regarding the use of my artwork. he amazing i love your style! what did u draw it with? Thank you for asking but please do not use this in any way. love how ot looks like its flying toward heaven! I found a second one copied from this wolf in her gallery too. Both reported. What do you use to color? Regular colored pencils? Ah, thanks for answering my question. The expression is so calm and joyful! I like the smooth line of his nose, the top of his head, and his ears. The shading on the fur looks great too. 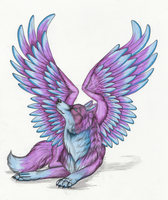 And the concept of wolf with wings... It's like an universal symbol for seeking freedom. This is beautiful! Fantastic job! I love how you draw wings. There is something about wolves having wings that I really like. this is super pretty. it looks as if the wolfs fur is glittery and sparkling. very nice effect with that. love the pose and colors! this is amazing. if i were to design a tattoo with this in it (and fully credit you on deviant!) would this be alright? I love this pic! Instant fave! Very pretty. Everything turned out so well! The expression, pose, wings, etc. are all great! I love those wings, they re drawn with a few lines, but yet so harmonic. That s a virtue if u re an artist. This is so beautiful, i dont think there is anything more i can say about it. lucky!! i want some wings! !